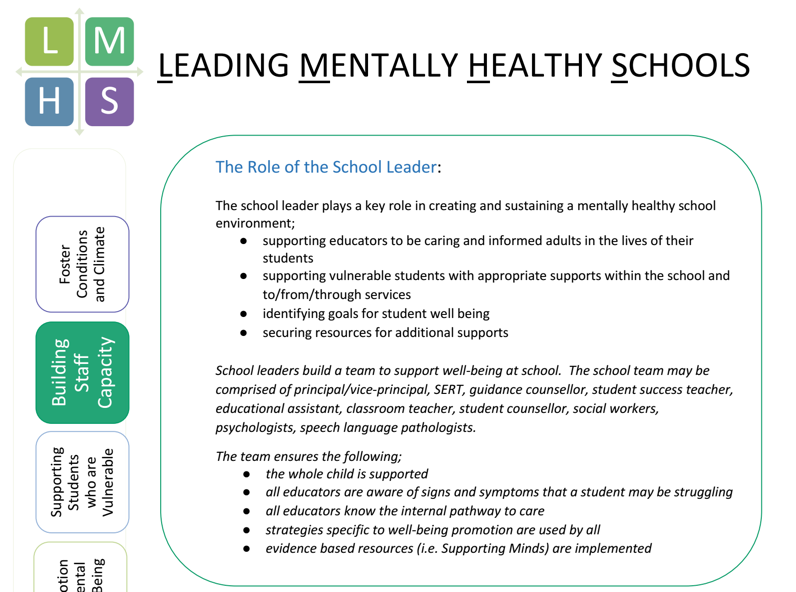 These one page Information Sheets, co-created with practicing principals in partnership with ADFO, CPCO and OPC, provides need-to-know information and handy web links in a friendly format for the busy school leader. 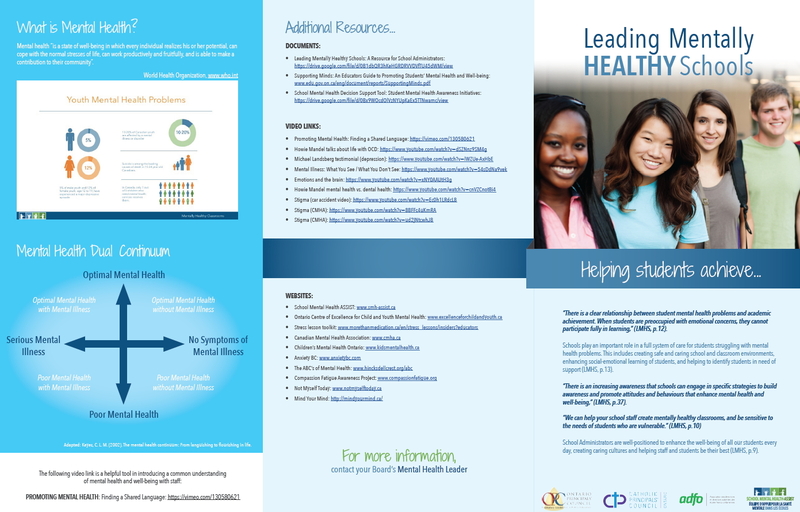 Learn more about Partner with Families and Community. 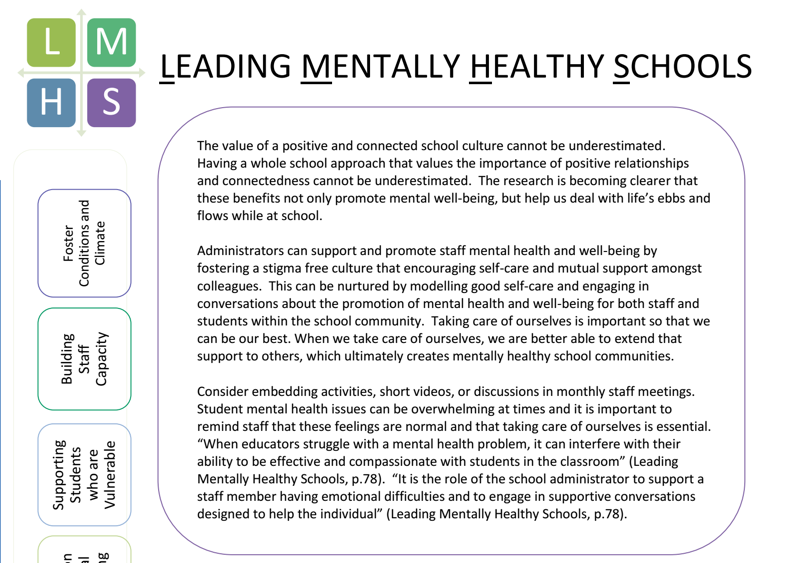 Learn more about Staff Well-being. 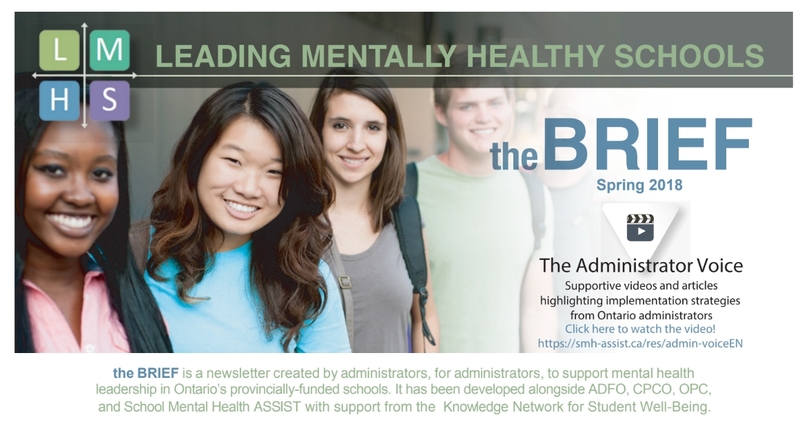 Learn more about Promotion of Mental Well-being. 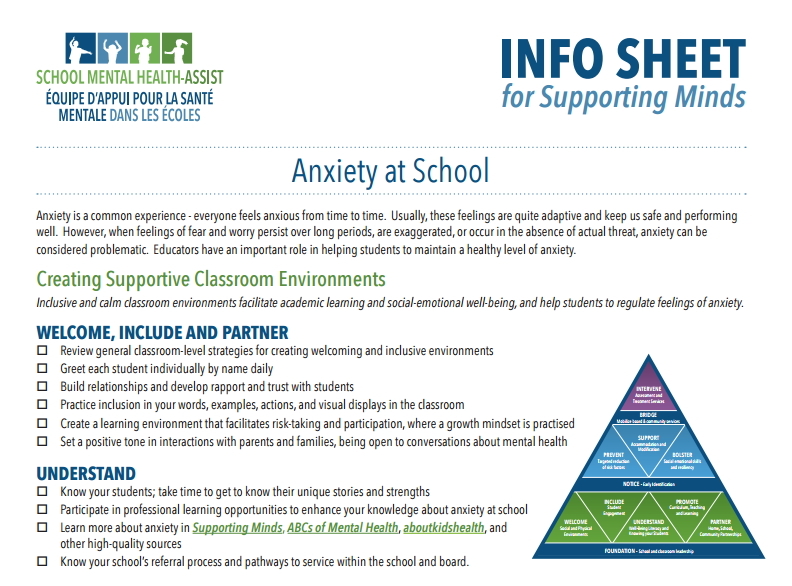 Learn more about Supporting Students Who are Vulnerable. 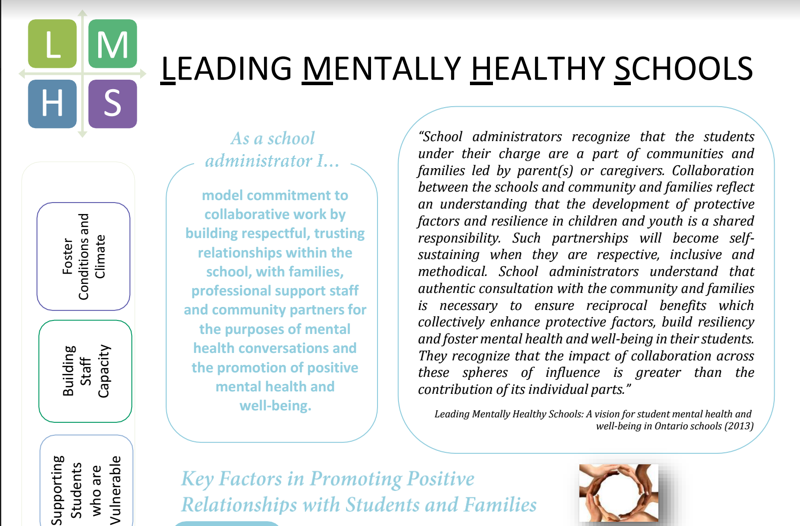 Learn more about Building Staff Capacity. 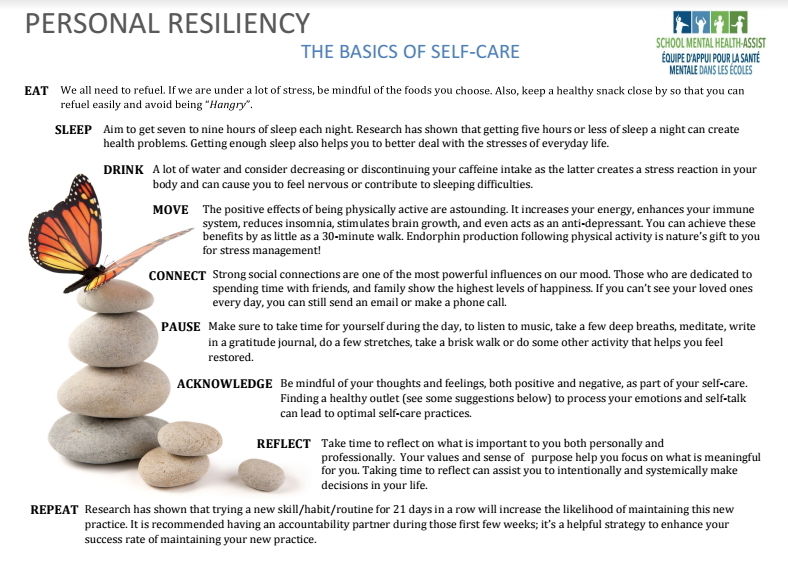 Learn more about Foster Conditions and Climate. 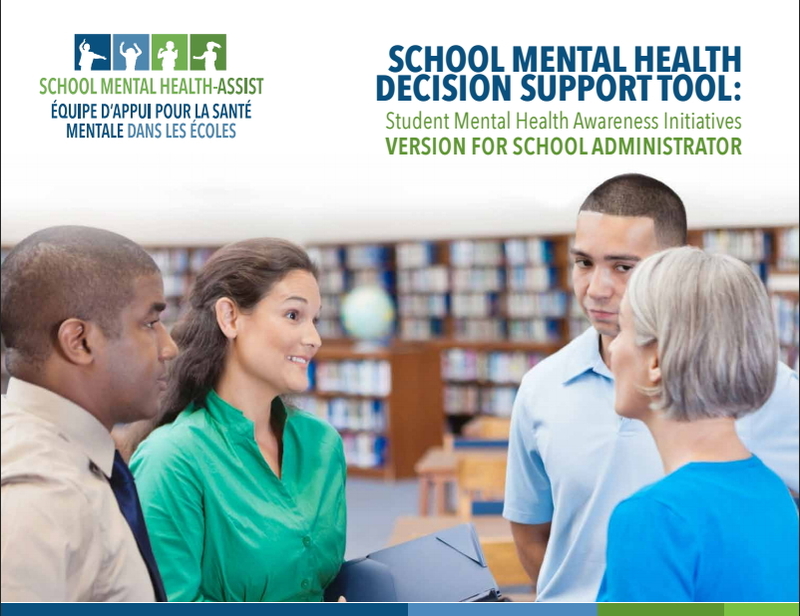 Setting foundations for high-quality evidence-informed mental health promotion and prevention programming at school is a critical first step! 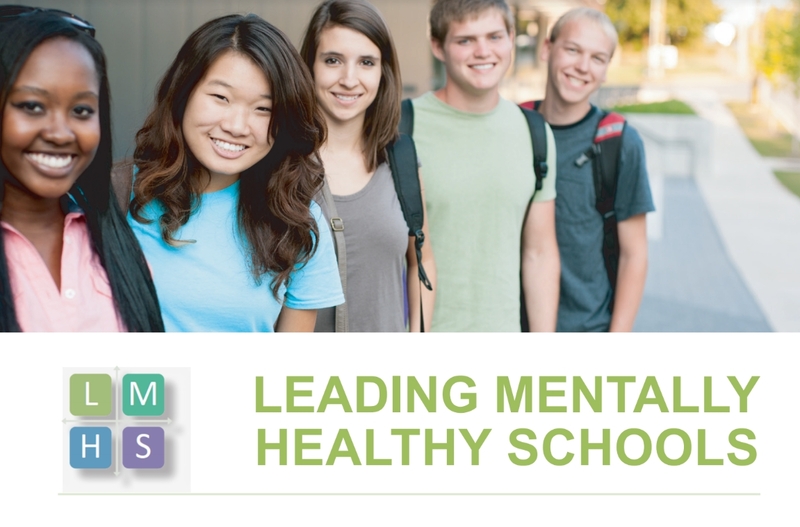 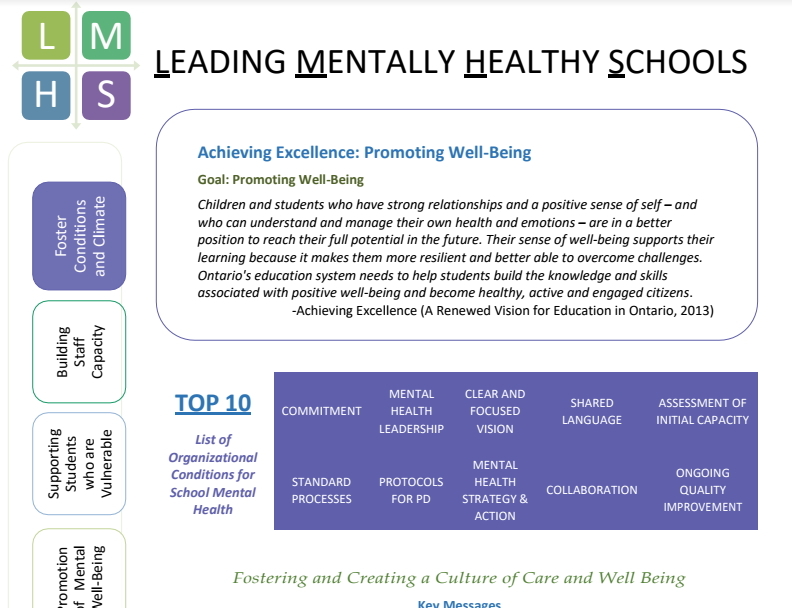 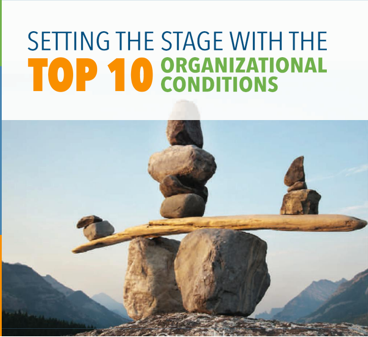 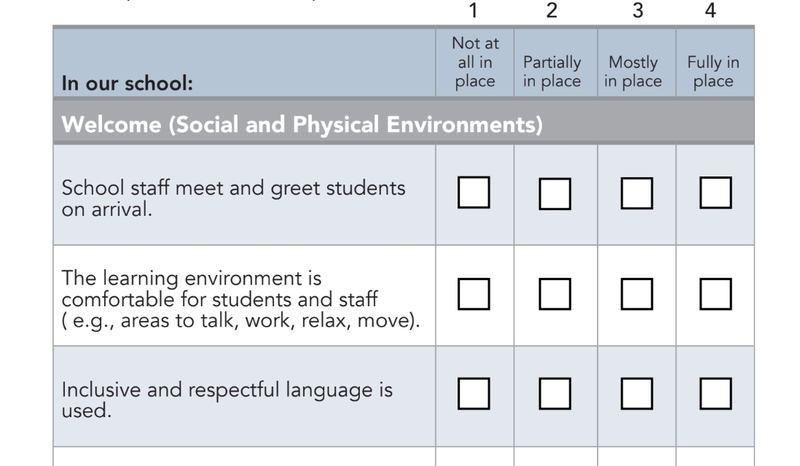 Learn more about Setting the stage with the Top 10 Conditions: SCHOOL PLANNING FOR SUSTAINABLE PRACTICES IN MENTAL HEALTH AND WELL-BEING. 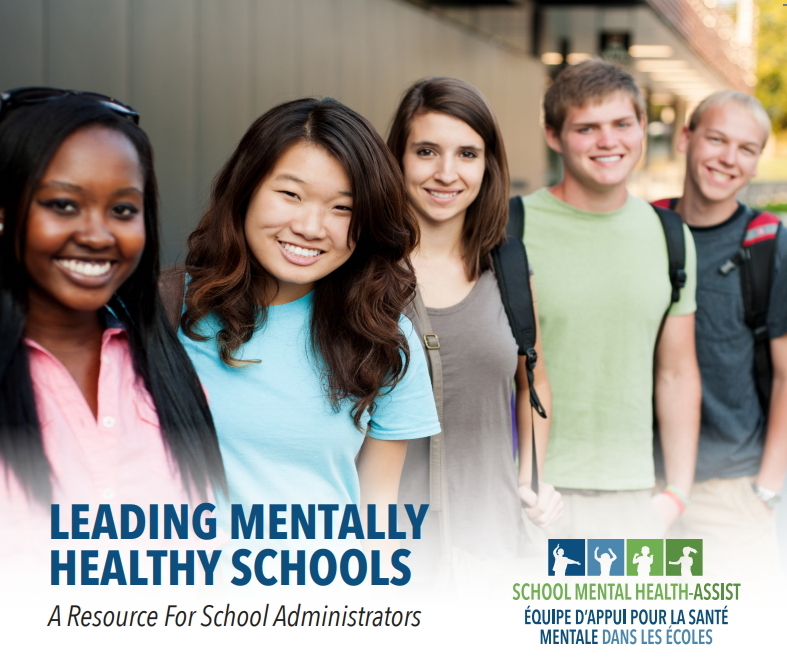 Research indicates there is a clear relationship between student mental health and achievement. 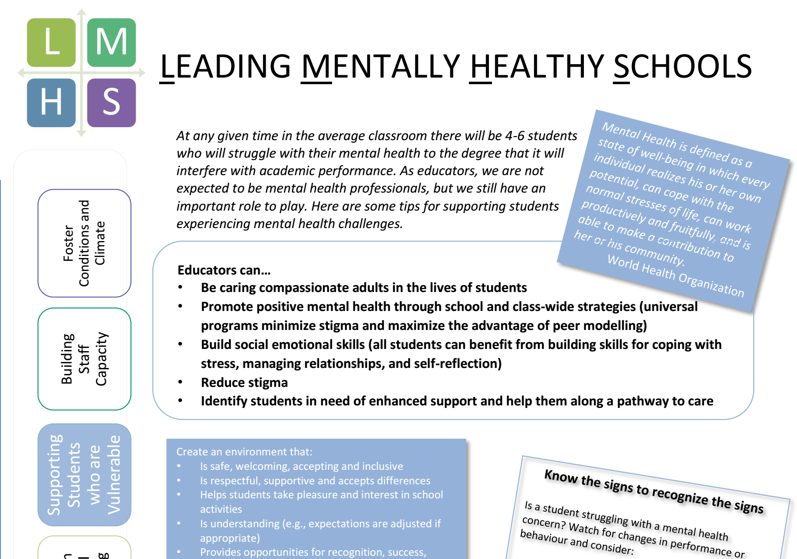 Learn more about Leading Mentally Healthy Schools Flip Chart: a reference of key school mental health concepts. 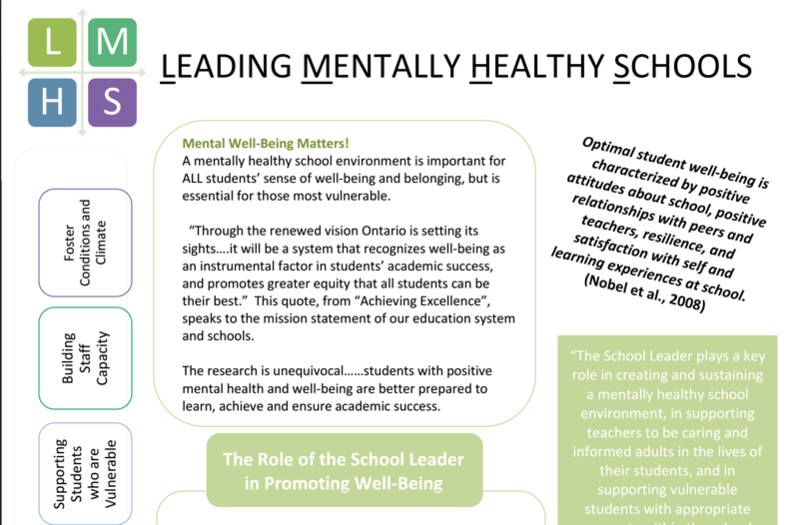 Mental health "is a state of well-being in which every individual realizes his or her potential, can cope with the normal stresses of life, can work productively and fruitfully, and is able to make a contribution to their community"
Learn more about Leading Mentally Healthy Schools Brochure: a quick desk reference for key concepts.